The Pro-Chancellor and Chairman of Governing Council, Chief Lawrence Ayinde Olakunle Osayemi, has charged members of the University Community to convert “research and findings” into practice. 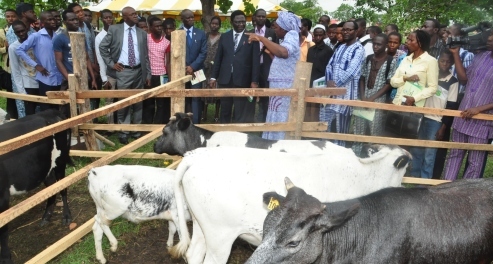 Chief Osayemi gave the charge on Wednesday, at the 2012 Yam Roasting Festival, held at the Teaching and Research Farms Directorate (TREFAD) Farms, Federal University of Agriculture, Abeokuta. According to him, agricultural research and findings should be converted into practice for the benefit of the society, noting that teaching and research, which its essence is to develop the nation is insufficient. The Pro-Chancellor stated that the University is lucky because the government’s transformational agenda centres on agriculture, stressing that the culture of improving the agricultural value chain must be improved upon. Besides, Chief Osayemi paid glowing tributes to eminent personalities who at one time donated structures to the University, including Chief Olatunde Abudu, the late Alake and Paramount ruler of Egbaland, Oba Oyebade Lipede, his successor, Oba Adedotun Gbadebo as well as the former Speaker, Federal House of Representatives, Rt. Honourable Dimeji Bankole. He described the festival as an epoch making occasion, adding that this is the first time he would be participating in such. Chief Osayemi expressed joy that the University, in the last three or four years have moved from a position of almost obscurity to high visibility, thanking all stakeholders who had made the feat possible. Present at the event are notable dignitaries like the former Secretary-General of Commonwealth, Chief Emeka Anyaoku; Chairman, Lafarge WAPCO Cement Plc, Chief Olusegun Oshunkeye and the representative of the Alake of Egbaland, the Oluwo of Iporo, Chief Alani Bankole.